NEW!! Located in the prestigious gated oceanfront community of Playacar Phase 1, Xaman Ha Condominiums sits directly on the beautiful white beaches of the Caribbean Sea. This spacious three bedroom condominium is situated at the very front of the complex and enjoys unobstructed views of the Caribbean and the lovely pool and gardens. This unit is offered for sale completely furnished and equipped and ready to move in. This unit has two master bedrooms, one with a king bed & futon, the over-sized second bedroom with a king bed & full bed, while the third bedroom has a full bed & twin pull-out trundle. This condominium is very popular with vacation renters and fetches up to $2000 usd per week in high season. 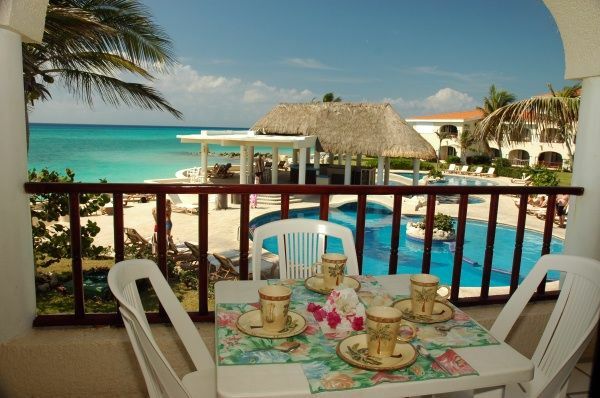 Owners and guests of this condominium enjoy access to the enormous pool and entertainment palapa and reserved parking. The complex is located just a short 5 minute walk from all the excitement of Playa del Carmen's 5th Ave. with its boutiques and international restaurants. Investors interested in Playa del Carmen Real Estate should not overlook this property. Please click here for more pictures of this tropical oasis! # Beach Real Estate - &#8220;webuyhouseskwik&#8221; Craigslist scam? Thursday, May 27, 2010 5:48 PM by Beach Real Estate - “webuyhouseskwik” Craigslist scam? Please send me your email address. So that I can help you with your client.